We call this our "barn." Our rabbit house is nothing more than a very strong canopy supported by a tubular steel frame, which can be purchased all over the United States at ubiquitous large membership warehouse stores. We have grouped several of them together to form our "barn." It doesn't have to cost a mint. We spent around $250 on one canopy. I went about building hutch frames and all-wire cages, one at a time, and then, as the herd grew and the cages filled up, we purchased another canopy... Perhaps you can do the same. We rolled up the canopy at the bottom, so air circulation carries away any ammonia fumes. There's about a foot of space by the ground, most of the way around. Because of this, our barn smells quite pleasant, as far as barn smells go. In the summertime, I loosen the fastenings of the canopy at the peak of the roof, releasing a triangle of canopy. This way, the warm air at the top of the barn can escape and cool air close to the ground can enter, maintaining ample air circulation in the barn. 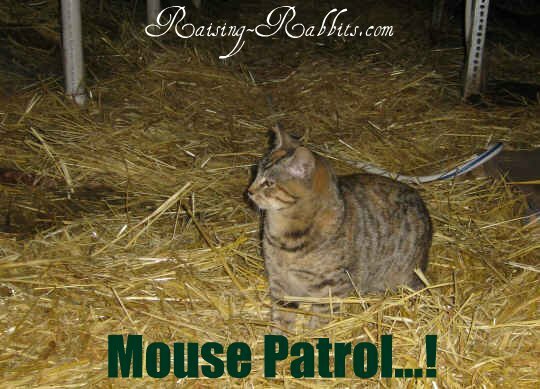 Temperatures can get chilly in the barn in the winter. It's December, and there's an inch of snow on the ground in Washington State. But that's okay. Rabbits prefer chilly weather to hot, because of their fur coats. They do just fine. And, we have bunnies in a nestbox in one of the cages. They'll be fine too - they're tucked in safely in a 'down-comforter-like' nest, bundled in their mama's pulled fur. Because the barns are so open, we put strong fencing all around the entire rabbit set-up, to help ensure the neighbor dogs and stray coyotes can't hurt our rabbits. Cleaning the rabbit house is a breeze. 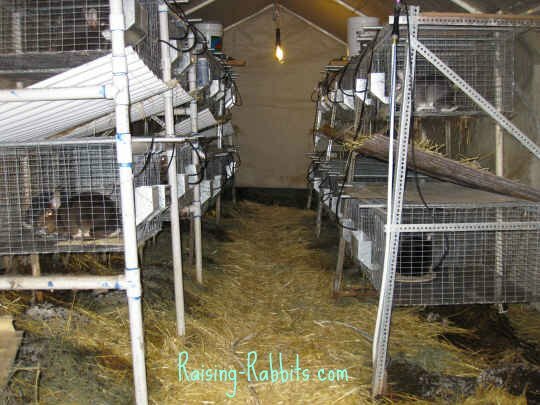 Every summer we remove all the cages from a PVC hutch frame, house the rabbits temporarily in small carrying cages, and pull the PVC frame out of the barn. The drop pans come off with a simple tug, and everything gets scrubbed down and put back. While the rabbits are out, we can also hose down the top and sides of the vinyl canopy, as these can get dusty and cobwebby. We don't mind the spiders as they help catch flies, but the old dusty cobwebs need to come down from time to time. This helps minimize the bacterial count within the barn, keeping the animals healthy.